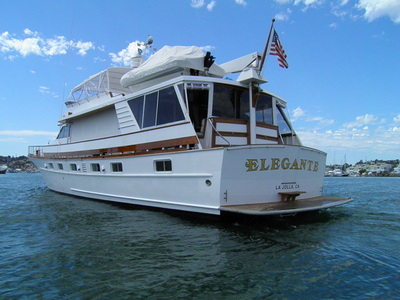 Elegante is a beautiful 'Classic' 82' all wood McQueen motor yacht. Her classy sleek lines are adorned with teak flooring throughout 4 staterooms to accommodate up to 10 guests. 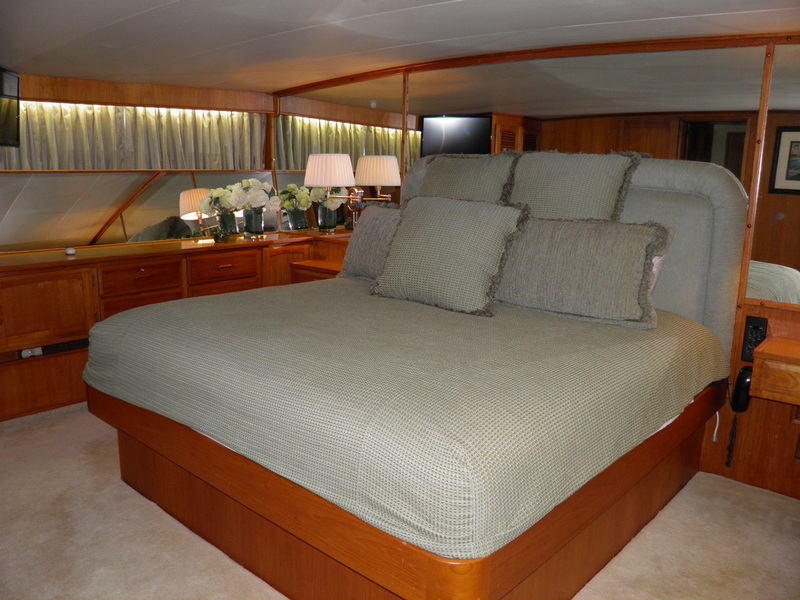 Master King aft with private en-suite bath w/jetted tub. 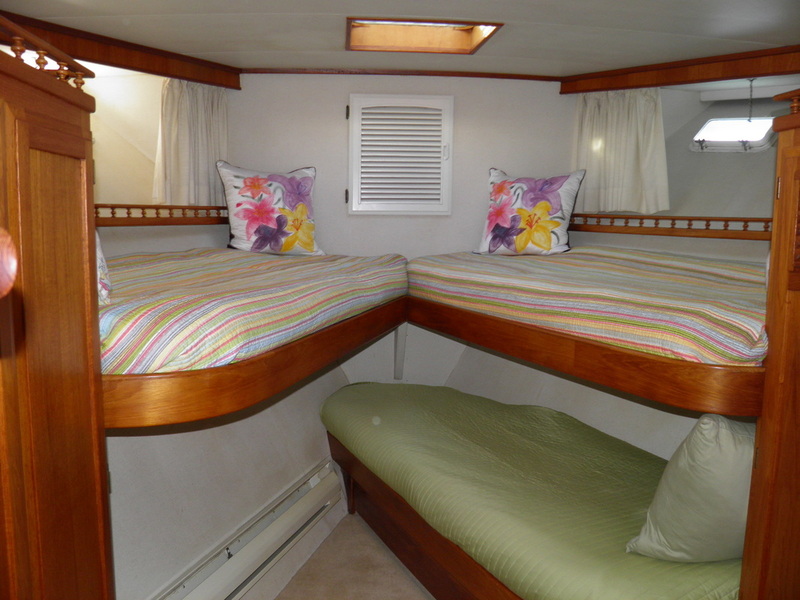 Midship you will find a Queen suite with adjacent head/shower. Forward of the galley you will find 2 more cabins, one with a double bed that has a single drop down bunk. Just forward of this stateroom you will find the 'V' cabin with 3 bunks. Both cabins join a 3rd head/bathroom with shower. 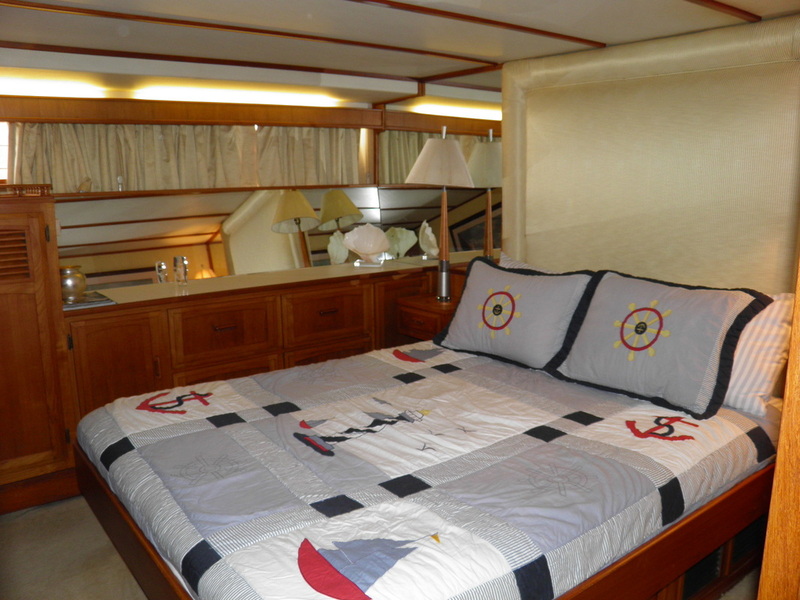 All staterooms have TV's with HD over the air TV available. 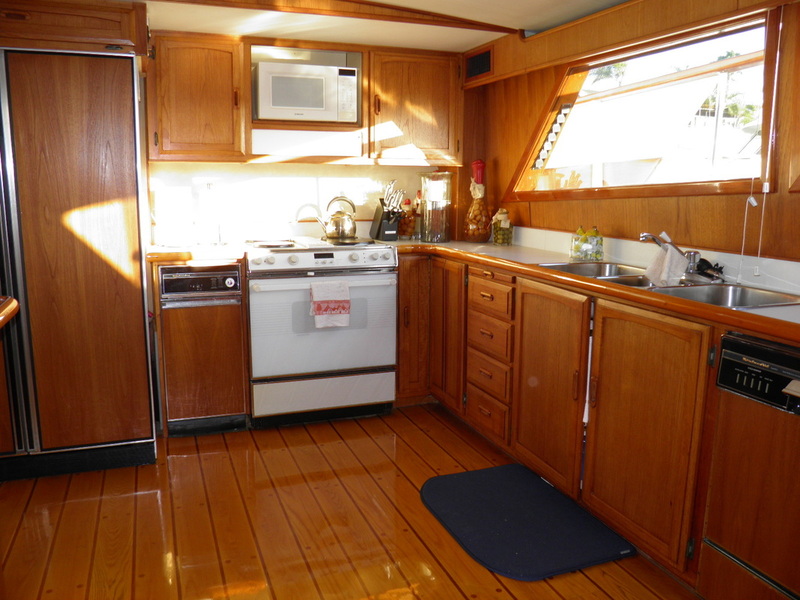 The spacious galley has a full size refrigerator/freezer, microwave, electric oven/cook top, full sized dishwasher and all the amenities of home. 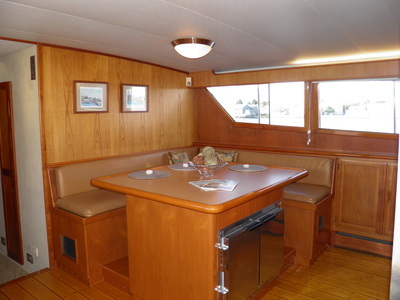 The aft deck is perfect for dining and entertaining. 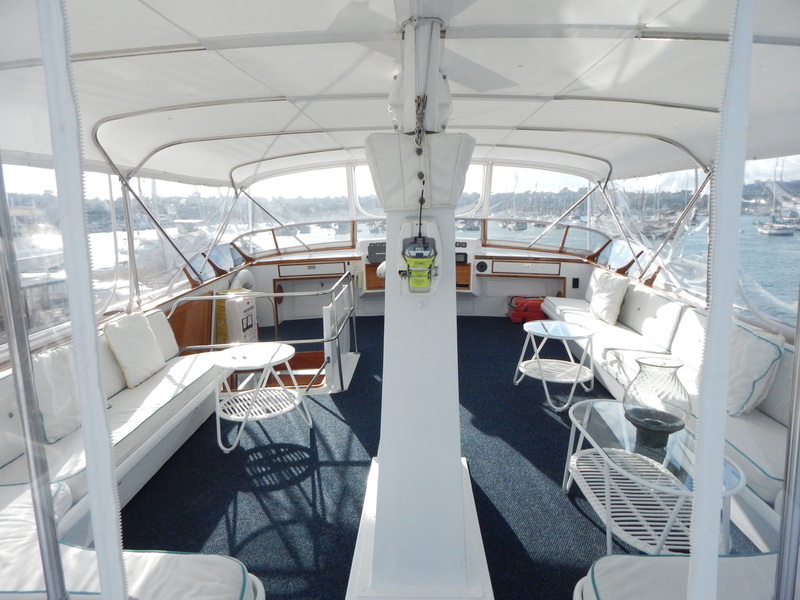 Enjoy the spectacular panoramic views of the marina and downtown San Diego. The Salon/Living room area has a TV with surround sound system. 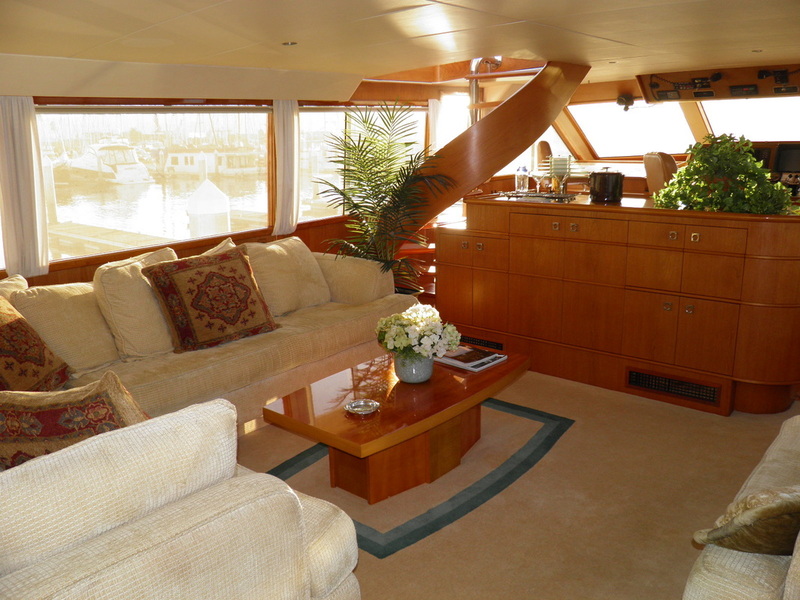 This fabulous yacht has a state of the art Direct TV system with all the music and video channels one could want. Free Wi-Fi is available throughout the boat. 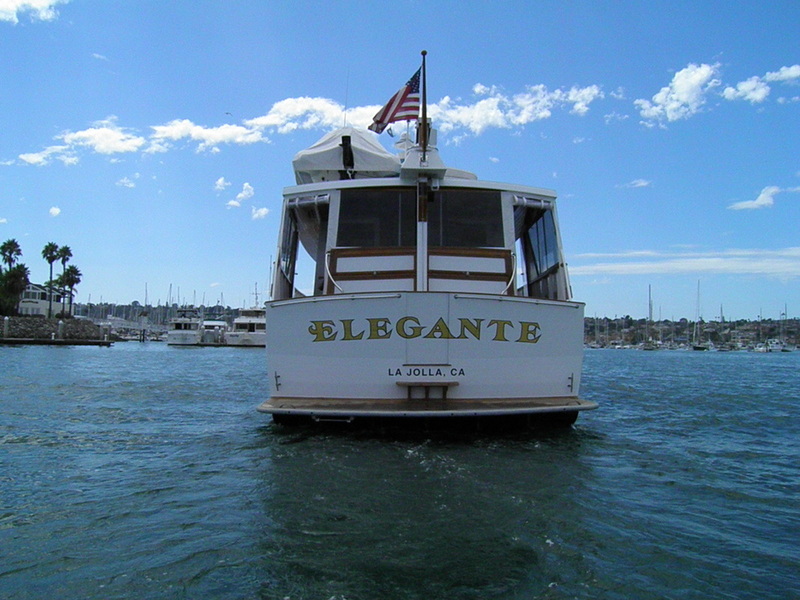 We go the extra mile on Elegante to make your stay comfortable and memorable. Towels and linens provided for your stay. Don't miss your daily work out; enjoy our fitness center and recreation room. Free Wi-Fi internet available, so bring your devices. Please note that the above rates midweek and weekend are Per Night and are based on 2 persons staying aboard - A fee of $50 per person will be charged to the above rates for any additional guests coming on board, up to a total of 12 persons. Holiday time periods and Special Event dates require a 3 - 4 night minimum stay. Deposits: DAMAGE DEPOSIT - of $2000 is required on a credit card. 50% Deposit fee is due upon booking and remaining deposit balance is only authorized and held on a credit card until completion of rental. Release and refund of deposits are outline in rental agreement. 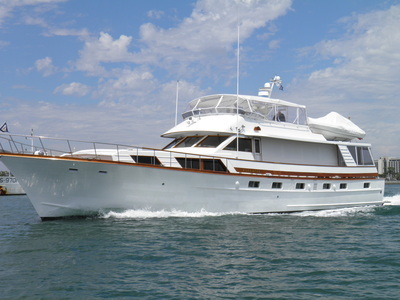 Other Fees: Rates are based on 2 persons staying on board. Each additional person coming on board or staying overnight is $50 per night, per person. Maximum number of persons staying on board is limited to 10: Total maximum number of persons allowed on board is 12. ***HOLIDAYS REQUIRE A 3 - 4 NIGHT MINIMUM*** Early check-in's and late check-out's require an additional fee and must be arranged and paid for in advance. Check in is between 3PM - 5PM. $25 add'l fee for any late check-ins between 5pm - 9pm. $50 add'l fee for any check-in's after 9pm. Additional fee of $25 will be charged for any single night stays. Elegante is available for skippered charters for up to 12 passengers; or add a Harbor Cruise on to any stay.